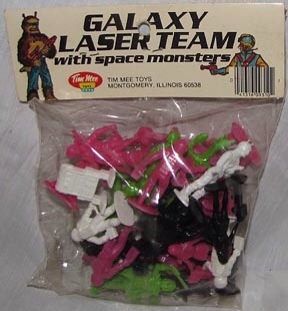 Just added a new section to the site, Tim Mee Galaxy Laser Team. If you grew up in the 70’s there’s a pretty good chance you had something from the Tim Mee company. They made “processed plastic” figures with all kinds of themes and sold them in bags for pretty low prices. The ones that I liked were, of course, the sci fi themed ones that bear a slight resemblance to Star Wars. Who’d believe that might happen? Gorgeous photos by a friend of mine. Very worth checking out. Just need to find the “X wing” space ships to round out the photo gallery.